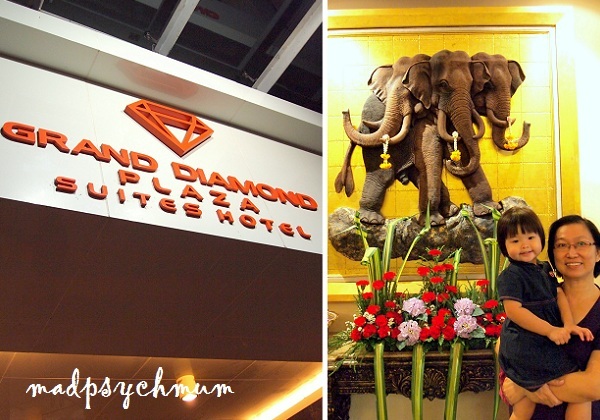 As we really enjoyed our time at Bangkok last year, we decided to plan another trip and bring my girl, my mum-in-law and brother-in-law. 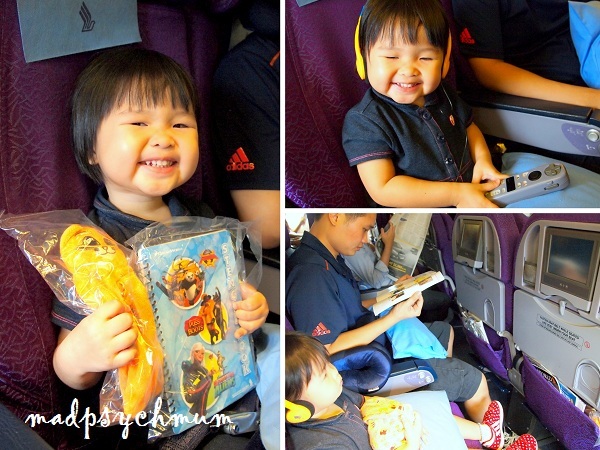 My girl was so excited that she was already thanking God in her prayers for letting her fly on an airplane! We arrived early at the airport and checked in. After crossing immigration, I brought my girl to play at the Family Zone at the transit area. 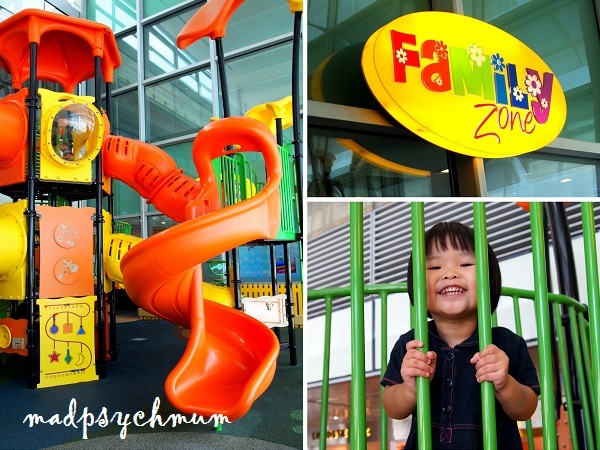 There's a huge playground, fully furnished nursing rooms and even a TV room for kids and their parents to hang out. My girl had so much fun at the playground that we became the last to board the plane because we couldn't drag her away from the slides. 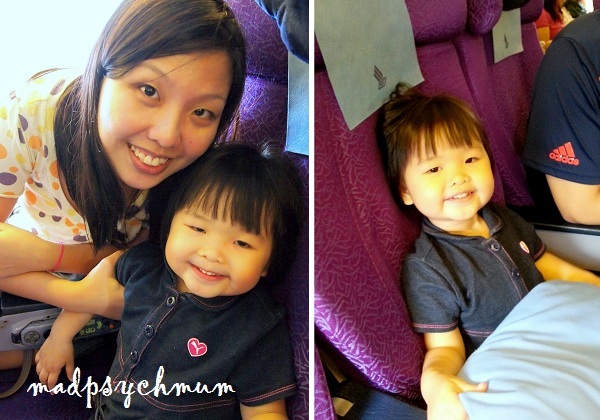 We were flying with Singapore Airlines this time as there was an amazing promotion online (each ticket only cost S$277!). Everyone is all geared up to go! But even the entertainment system couldn't keep her eyes open for long as she soon fell asleep just 5 minutes into watching Disney Junior. All the excitement and play had finally tired her out! With my girl fast asleep (she's an awesome traveller like that), we had a moment of peace to watch a movie and eat our lunch. And just as I was getting comfortable in my seat, the Captain announced that it was time to land! The total journey was only 2 hours. We crossed the Thai immigration pretty smoothly and proceeded to get a public cab at the ground floor (2 floors below the arrival hall). 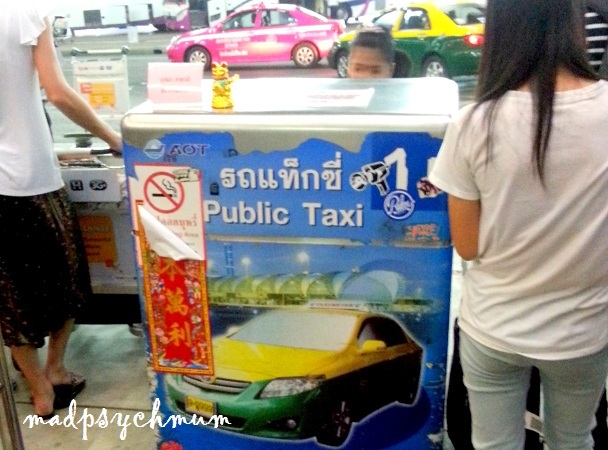 We had a lot of luggage so we needed a larger taxi and ended up paying 770 baht for our cab fare (much more than the 320 baht we paid previously). 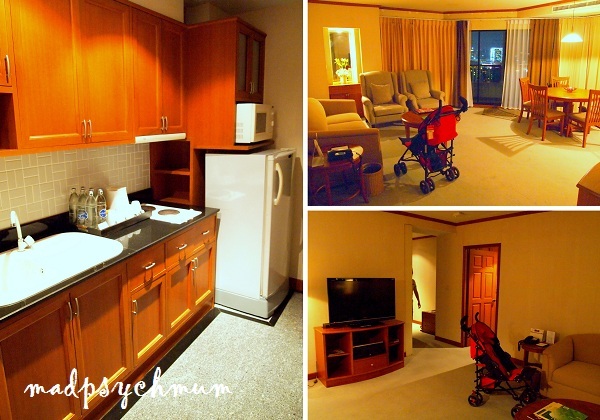 And unlike the previous trip where we stayed at the fancy Novotel Platinum Hotel, we stayed at Grand Diamond Suites Hotel this time due to the availability of family rooms that suited our big family. 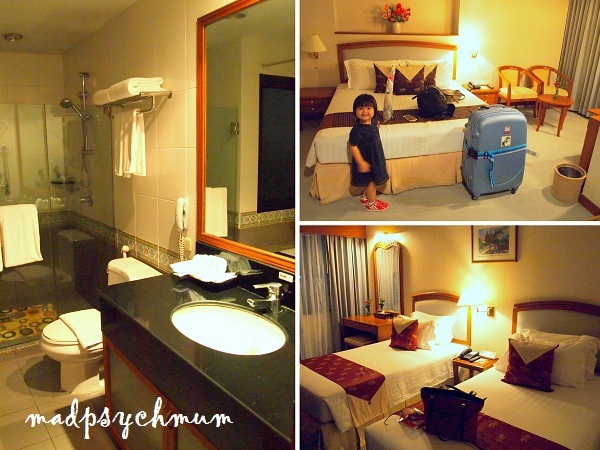 There were initially many things that were wrong with our room. First, the main light in the living room was not working so the living room was extremely dark. Second, the faulty electric kettle caused the power to short-curcuit the minute we plugged it in. We had to call housekeeping to bring in an electrician to deal with the problem. It took a while before everything was fixed (thankfully we had no problems after that for the rest of our trip) and we could head out for dinner. 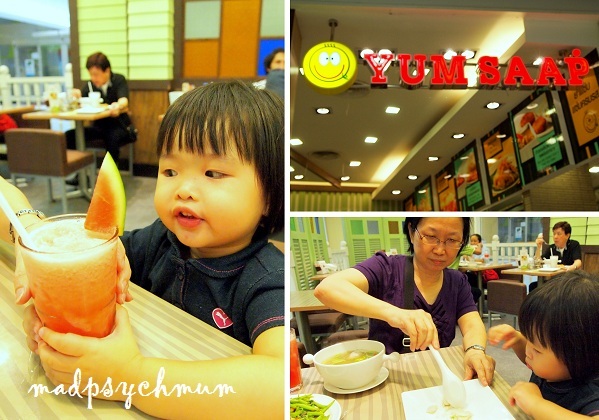 We decided to take a 10 minute walk to Big C, where we had our dinner at Yum Saap. The next day we woke up late as my girl didn't sleep well and kicked both her daddy and I throughout the night (neither of us were used to co-sharing a bed!). 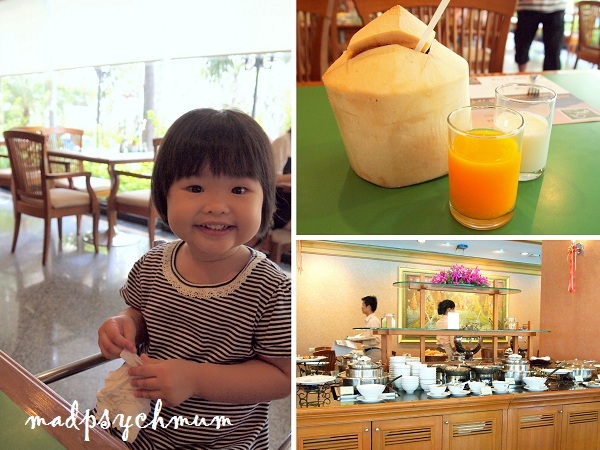 We were famished by the time we headed down to the breakfast buffet provided by our hotel. My family loved the fresh coconut juice straight out of the husk while I liked the crispy croissants (we have very differing tastes). 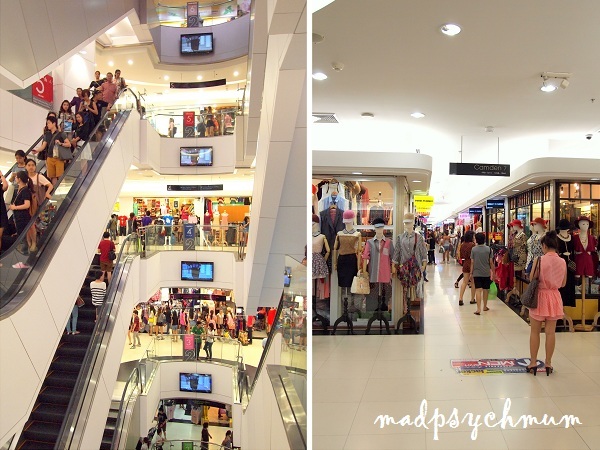 After breakfast, we did our shopping at Platinum Mall, which was located just next to our hotel. And when baby girl and the guys finally got too cranky with all the walking (we managed to cover a large area record speed! 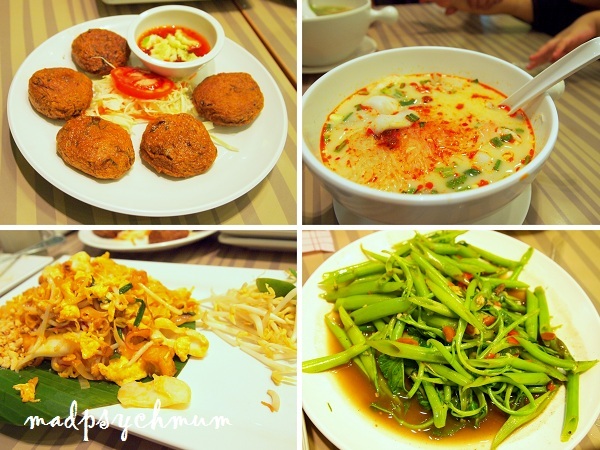 ), we had our lunch at the food court at the 6th floor. I have no idea how a little bit of shopping can make the guys hungry so soon after a heavy brunch -_-. 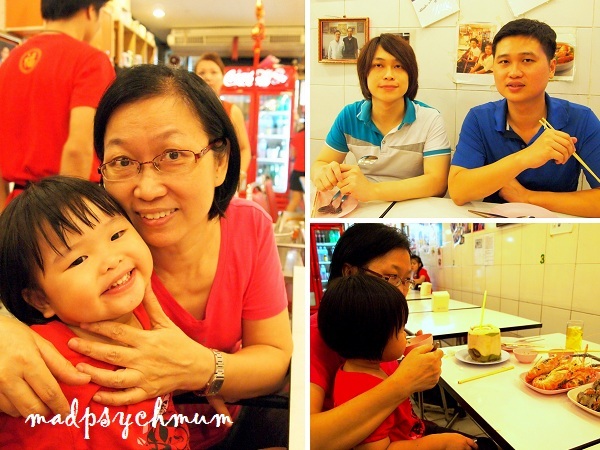 After our short recharge, we continued more of our shopping before heading off to Chinatown to introduce my in-laws to the famous birds nest soup at Nam Sing. 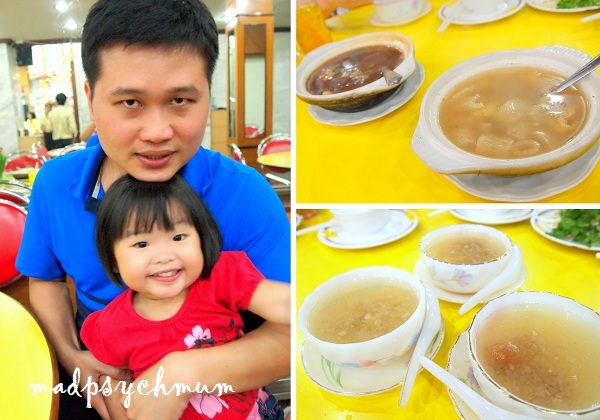 We thought the birds nest soup was delicious but felt that the sharks fin soup that my mum-in-law made during CNY was much better (she was obviously beaming after we said that, which was true! =P). Next, we crossed the road to our usual massage parlor for cheap massages (the cheapest of our trip). Per hour, foot/ shoulder massage is only 150 baht, Thai is 200 baht and Oil is 400 baht! Of course since it's cheap, the skill of the masseuse may not be as good (一分钱,一分货). It also depends on your luck because I had a good experience the first time that I patronised but this time, the masseuse massaged so strongly that my inner thighs hurt like crazy after that -_-. 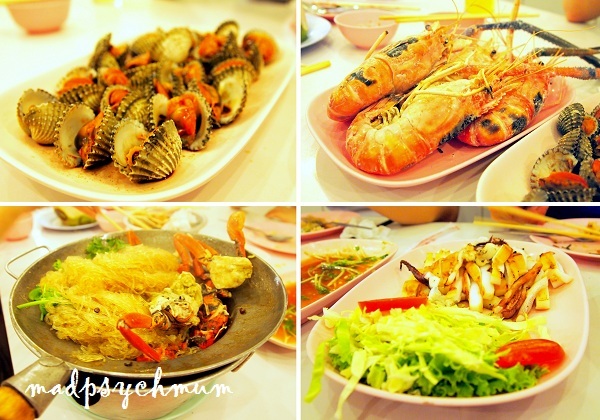 After our massages, we had a sumptuous seafood dinner at our favourite restaurant at Chinatown.